Thank you for this detailled explanation. Maybe the settings is also important (not sure). I am using divisor 10 to be more compatible with Happy and Super Archiver. 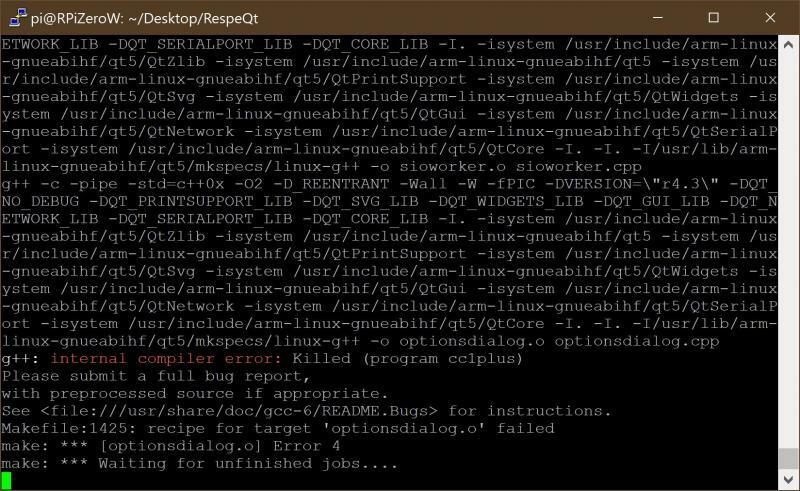 Did you try RespeQt under Windows with Seven Cities of Gold ? Anyone else experiencing problems with Seven Cities of Gold with RespeQt 4.3 ? I tried all three of those versions above under Windows using the binaries posted in this thread in December. I have *not* tried them yet under Ubuntu, though I will later today. In my case. all three get to the animated title screen but freeze when I press START to play a game. As for settings, I tried stock 1050 (no Happy or Archiver settings at all, since my real floppy does not work when I use my Happy 1050 in Happy mode). I was not adjusting POKEY divisor settings at all when trying ATX files, just stock 19.2 kbps (standard SIO disk speed). I tried different OS ROMs too - XL, XE and a copy of OS B padded out to 16K for use in my Ultimate 1MB board. Didn't make a difference for me. I can try adjusting POKEY divisor manually, and maybe tweak the default timing delay in the RespeQt options later this afternoon. The protection is based on timing. So I guess something is affecting the timing used to answer the Atari. I am using Lotharek's SIO2PC on a USB2 port on an old Dell computer. It would be interesting to compare the log when you load SCoG and when I do the same on my configuration. Maybe it will reveal something. Tried today under Unbuntu - wow, worse performance with this title than under Windows. The game freezes right after the second log entry regarding phantom sectors. Even up to that point though, performance is very herky-jerky, with noticeably larger gaps between sector beeps than under Windows. Back to Win10 however ... Still no success no matter what I try on this one. My log is below, under the spoiler tags. As you can see, nothing stands out. The last entry, setting the emulation speed, appears when I press START to load the game from the title screen. [Disk 1] Mounted 'Seven Cities of Gold, The (1984)(Electronic Arts)(US)(Side A)[black disk].atx' as 'SD Diskette (90k) - Image 2/2'. I'll add that I have the drive set to defaults (No Happy or Archiver emulation, standard SIO speed, etc). EDITED TO ADD FURTHER: Any of the same files will load on the same hardware (1088XEL) via my SDrive-MAX. So I dunno what's going on with RespeQt. Edited by DrVenkman, Sun Feb 10, 2019 3:35 PM. Edited by _The Doctor__, Sun Feb 10, 2019 3:42 PM. Made no difference, as it rarely does with modern hardware and up-to-date drivers. 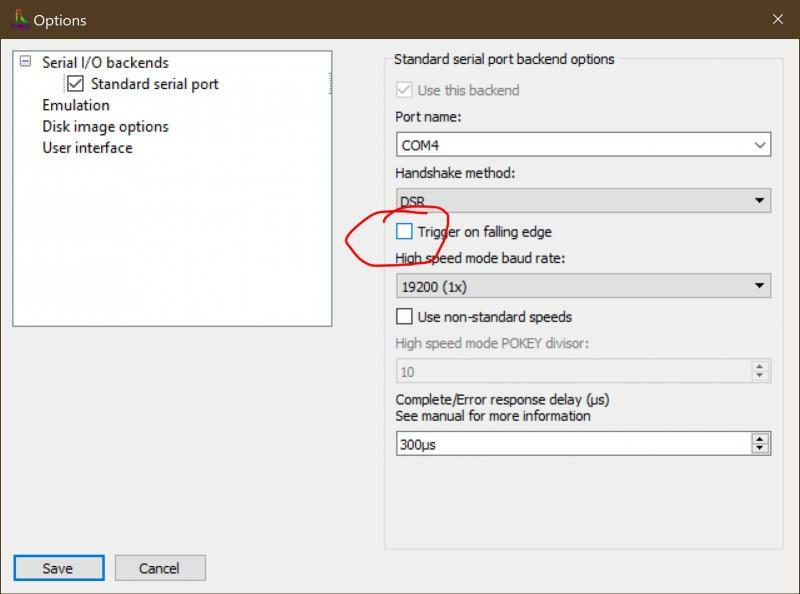 No, rather the problem was something else, set as a default in this version of RespeQt evidently: "Trigger on falling edge"
I don't remember this setting in prior versions, but as soon as I unchecked it, loading SCoG started working as expected. Note that having this checked did not complicate or prevent loading of a number of other ATX files, but it did cripple loading of SCoG past the animated title screen. I haven't yet checked to see if unchecking the box will cause difficulties with other ATX files. I am happy that you have found the right settings. It is also unchecked in my configuration and nearly all titles are loading. Yeah, I have no idea. I certainly didn't check that box intentionally. I still have a copy of Joey's last release (r4) and the setting didn't even exist in that version. falling edge is the normal setting for serial, by unchecking that- one of the flow control modes will stop working and you will have advanced the timing on the other flow control lines. Edited by _The Doctor__, Sun Feb 10, 2019 5:19 PM. I wish there was a sticky that had the latest binaries. WinXP32 in my case. The latest and greatest gets difficult to find. Here you go. I attached the binaries for Win32 and Mac. These are a roll up of ebiguy's and my forks. Also a Linux 64 bit build. I merged your pull request. Great work on printer ! I have a layout issue with your printer widget. I am not using D9-DO so I hide them. When hidden the display of P3: and P4: overrides the drives D1-D8. I would suggest an option to hide also P3-P4 (which will be rarely used IMHO) so that the right side (D9-DO and P3-P4) fully disappears. Do you think you can add this option ? Can you or someone build some Win64 binaries and post them? I'd love to give this a try this weekend. @All: How should I deal with such an option to hide the right column? 1.) 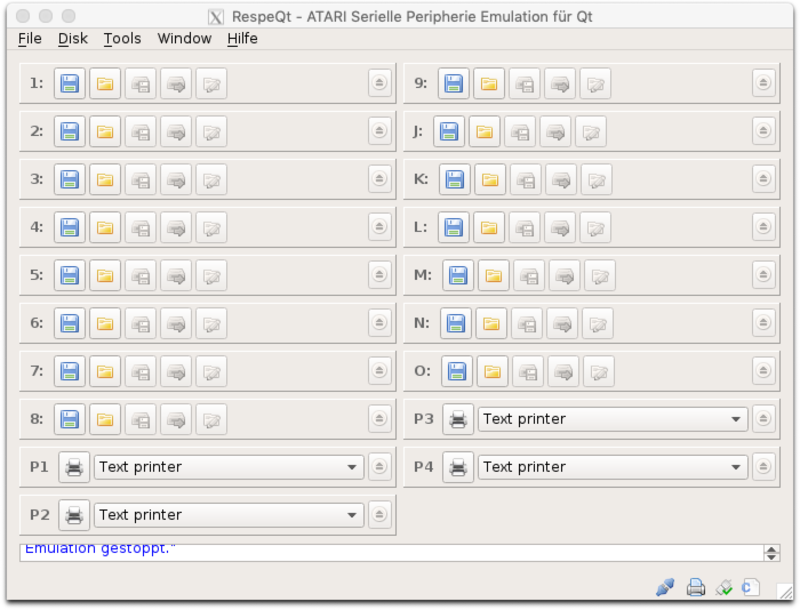 Should the left column just expand to the existing windows size? 2.) Should the window width be halved? @ebiguy: I pushed the change for the printer widgets. They now hide and show with D9-DO. I merged your work. Thank you for fixing this issue so quickly. After compiling, i tried this new version. I really don't like when the application changes my settings. The size I gave to the window IS a setting as it is kept from one session to the next one. Changing the window size is definetely not a UI best practice. IMHO, there is no choice here. Try to activate different panels in the File Explorer, the remaining parts extend to fit the window size. I didn't change the window size behaviour. The code was there before and it changes the minimum width size. If one comments the two lines the shown left column extends over the while window width, when the right column is hidden. I was waiting for the others chiming in. Perhaps we can make that configurable. BTW, when I was at it, I again looked at the native menu bar issue on macOS. I solved that, and it will be configurable. When I have checked, that my code works on Windows and Linux, I will push it to ebiguy and provide some binaries. Edited by JoSch, Tue Feb 19, 2019 1:59 AM. If anyone manages to compile the 4.3 branch in Raspbian, let us know please. The “internal compiler error” I get is infuriatingly vague. So, I made binaries for Win32 and Mac. @DrVenkman: I have to get out my RaspberryPi and try to build it. Stay tuned. I was able to build ebiguy's develop branch (0277736) on my Pi 3 B. I updated the OS with apt-get dist-upgrade before building, but g++ was not updated. Interesting. I have the same g++ version installed on my PiZeroW, though my kernel is older. Just did a sudo apt-get update and now sudo apt-get dist-upgrade Once all that's done I'll try to compile it again. Otherwise I'll try the binaries you compiled and see if they work. I *really* hope they do. Although I have a Pi 3 B and 3B+ in the house, both are being used full-time for other tasks. 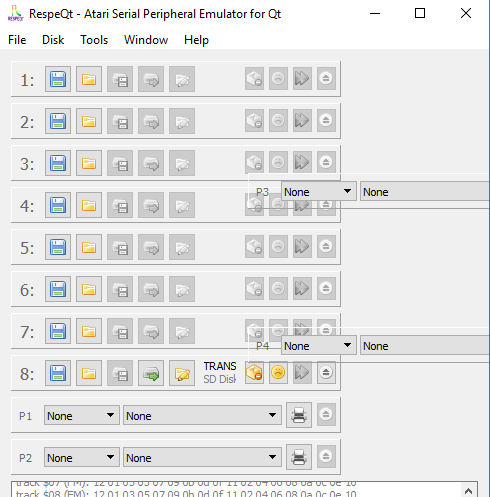 This PiZeroW has worked flawlessly for prior versions of RespeQt until now. Okay, now after cloning ebiguy's develop branch to my desktop and running qmake, I get a new error, no doubt related to the printer support. I seem to be missing svg support in my Qt installation. Off to go try to figure that one out … Ah, I need to install the Qt5 SVG dev tools. Okay, that's fixed. Now to see if the make process works. Edited by DrVenkman, Wed Feb 20, 2019 6:40 PM. Rats, still fails on the PiZeroW. I might remote into one of my other Pi's here in the house and see if it's just a limitation of the ZeroW - maybe it ran out of memory or something during compilation?